I Sawed Off the Awkward Changing Table Hump! Or I should say, my husband sawed off the awkward changing table hump! 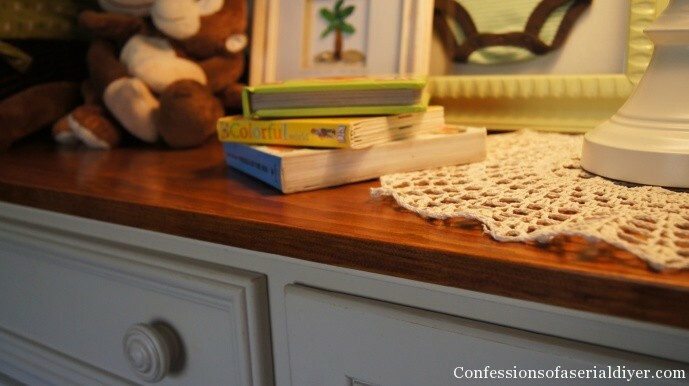 These days new parents are using beautiful credenzas and dressers as changing tables. What a smart idea. 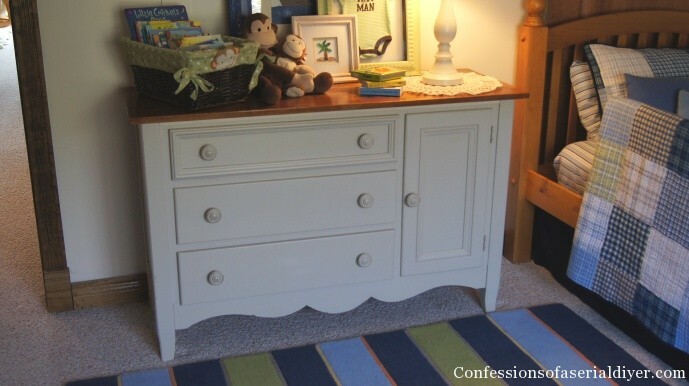 I used a traditional changing table complete with “awkward hump” that I really loved when my children were babies. It was only awkward when I no longer wanted to use it as a changing table. I can’t complain because my mom purchased this for my ten year old when he was a baby. 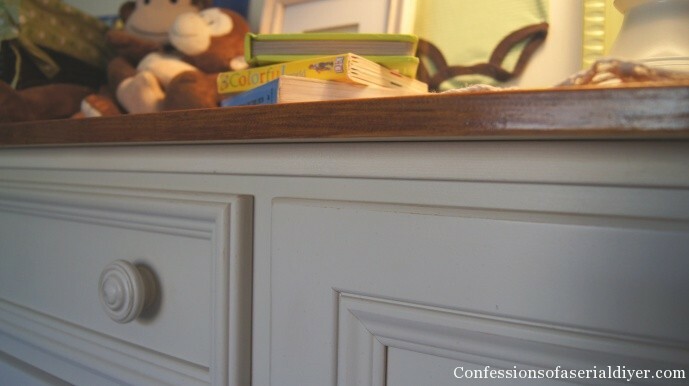 He used it as a dresser until baby number two came along two and a half years ago. I’ve definitely gotten a lot of use out of it. But now that baby number two has long outgrown it as a changing table, I knew I needed to start searching for a new dresser for him. 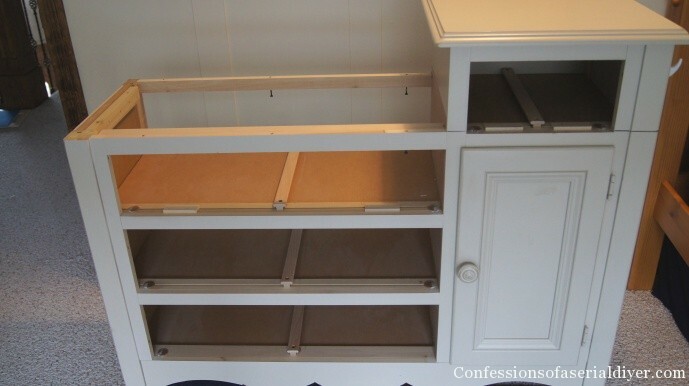 I hadn’t gotten very far in my search when one night while reading to my two year old in his room, I got the idea in my head to convert the existing changing table to a dresser. I still love the finish and thought it would be awesome if my idea worked. As you will soon see, it did! It was a really sweet addition to both of our babys’ rooms. But it’s time had come. This is what we did to make it over. You can see the screws that held the top on. I removed the top and drew a level line for my husband to cut. 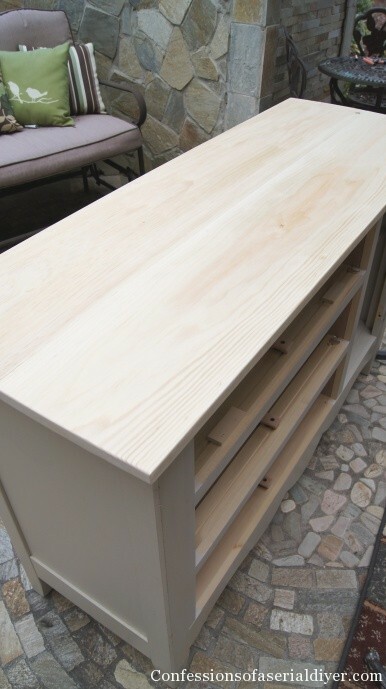 To make the top, I purchased a piece of 10″ x 8′ x 3/4″ pine and had them cut it to two pieces 51″ each. Then I used wood glue to attach them together to make one wider piece. After the glue was dry, I sanded it smoothing out the edges. Next, I applied the stain and polyurethane and reattached the top. 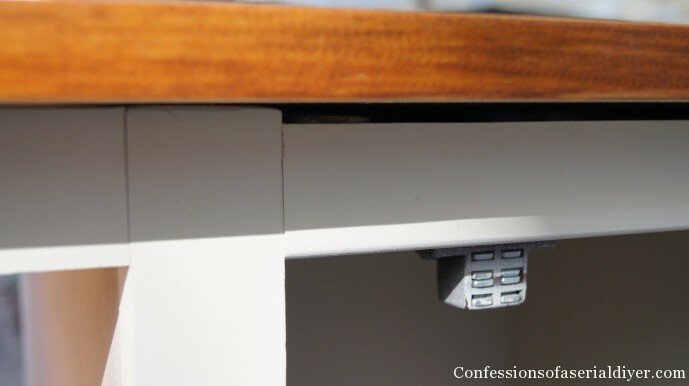 There was a slight gap where the drawer on the top piece once was. So I added a small piece of trim I had in the garage to fix it. (I used mirror adhesive to attach it. It will be our little secret, ok? This update cost me $21. That’s a lot less than a new dresser! I chose the stain to coordinate with Brennan’s existing bed. 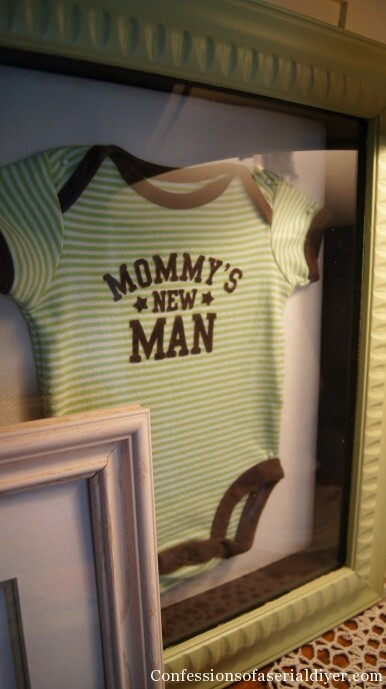 This was one of my favorite onsies that Brennan wore as a baby, so I displayed it in this shadow box frame that I painted to match the room. 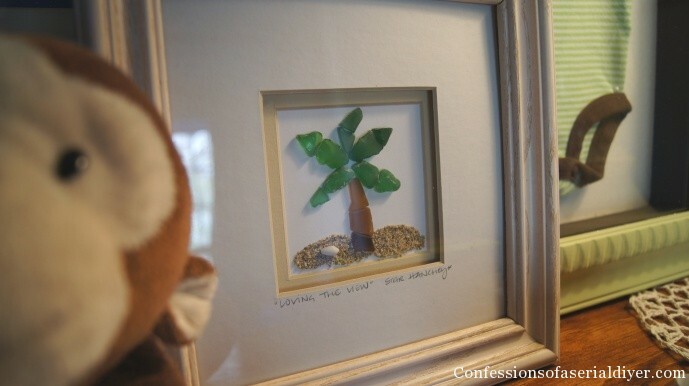 I also love this little picture of a palm tree made from recycled glass. I purchased it years ago from a local craft market. I am so glad it worked! I really could use this piece anywhere now. With a new coat of paint, this could even serve as a pretty sidetable. Next, I’ll be moving all of Brennan’s toys from downstairs to his room. I’m already brainstorming ideas for toy storage. Then I’ll reveal the completed room. Update: See his updated Big Boy Bedroom on a Budget here. What a great idea. I have always wondered what could be done about those “humps”. The stained top looks fantastic. Good work! You are the smartest person EVER!! Honestly I never understood the purpose of that hump to begin with. My friend had one and her son got too tall way before he was out of diapers to go on it. If the hump wasn’t there, they could have used it the whole time! Thanks, Susan! I don’t understand it either, come to think of it! So clever, Christy. You are so awesome to be able to do the work yourself. Thanks so much for stopping by my blog. Awesome! 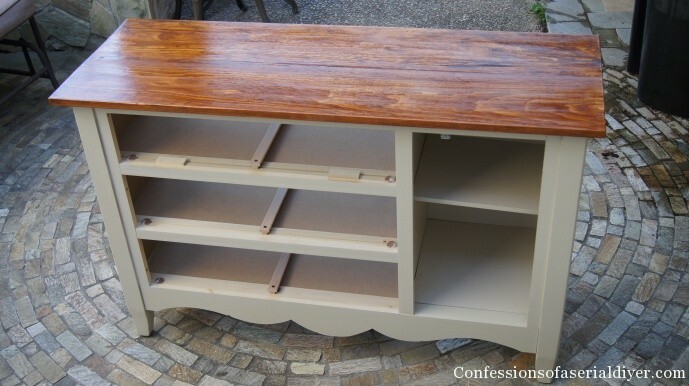 Love the transformation and the paint/stain combo. I would love it if you linked this project at Thrifty to Nifty Thursdays at A Jennuine Life – http://www.ajennuinelife.com/2013/03/thrifty-to-nifty-thursdays-10.html. Great job, Christy! 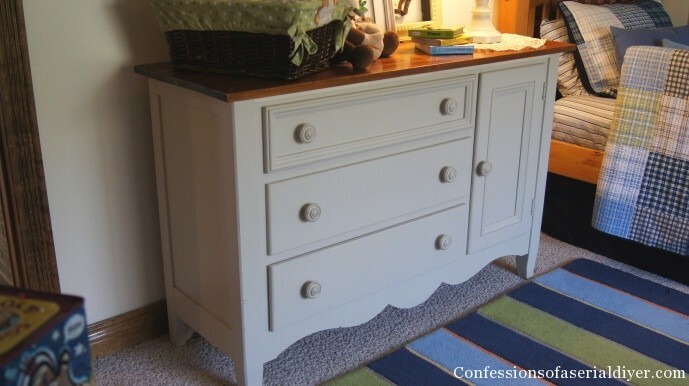 Way to extend the life of a great piece of furniture! That new top looks really great and no one will be the wiser with that trim added on. Looks fabulous! I love this idea. It looks absolutely fabulous and seems much more functional. Thanks, Ruth! It works so much better in the room now! Christy you are amazing! 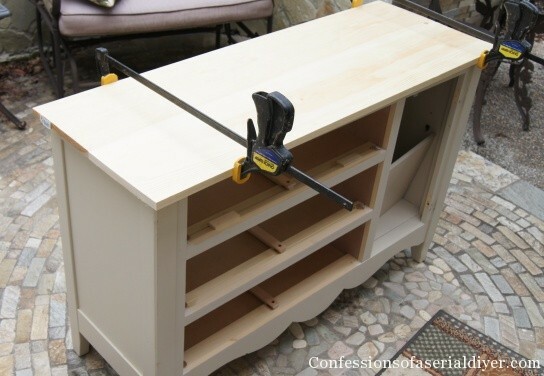 What a great idea, I don’t think I would ever haved considered sawing off a top like that, and boy it came out so good!!! I love the stained top for a contrast too. Thant was a great idea. the chest looks perfect. The pic of your husband sawing off the hump could be a pic of my hubby! 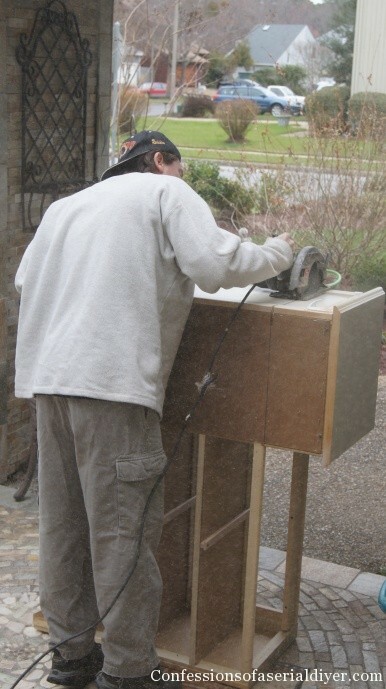 I have no idea if our husbands actually look anything alike but I often have a project that I rope him into and this is the sight of him; hat turned backwards, dusty work clothes and the sweetness to do my next crazy idea. Brilliant. 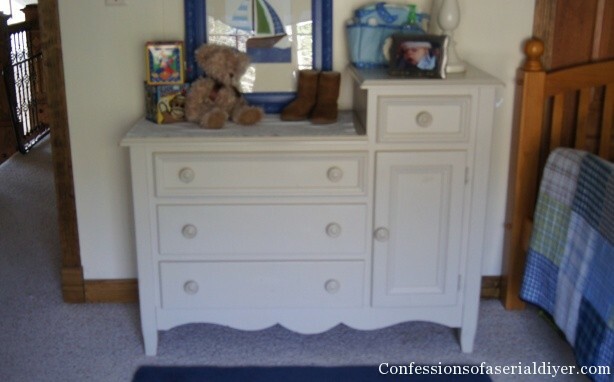 I have the same exact dresser and was just wondering what could be done with it. I purchased it in ’09 just before the birth of my first child. 3 others have used it since then. Now, it’s time has come. I will definitely be giving this a try!